A Denver women’s group called Inspiring Minds produced this video in response to a presentation Dr. Chris Thurstone delivered earlier this year as part of its 2012 lecture series. Women in the room that day were like so many of the hundreds of other people who have listened honestly to a reputable expert give an overview of the current science of marijuana use and addiction — particularly as it pertains to adolescents. They were amazed — and alarmed. So, the women behind Inspiring Minds got to work this month. They were, perhaps, even more outraged after seeing a disgracefully misleading television commercial running in Colorado, where there is an effort to amend the state’s constitution to legalize weed for recreational use (If you live in Colorado, Vote No on 64, by the way). They pulled together this video using an iPhone and a Mac laptop — a noble effort to push back at drug-legalization champs who have funneled millions of dollars into marijuana legalization. We at Inspiring Minds believe you should know the facts. 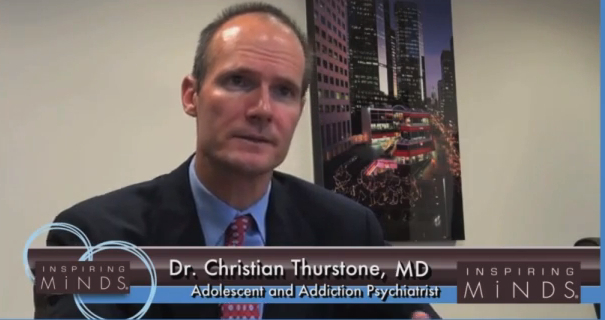 Listen to Dr. Christian Thurstone, M.D., describe the dangers of Amendment 64. He is a nationally recognized adolescent and addiction psychiatrist, recently awarded by the White House for his work with adolescents and substance abuse. Whether you are voting yes or no, you need to hear his message.